Flying or going to higher altitude soon (12-24 hours) after diving. This increases the pressure gradient. 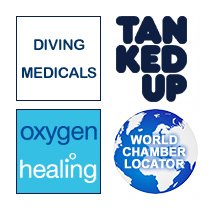 Divers who have been chilled on decompression dives (or dives near the no-decompression limit) and take very hot baths or showers may stimulate bubble formation. Decompression tables: Decompression sickness may occur even if the decompression tables and no-decompression limits are strictly observed. The decompression tables and no-decompression limits list the maximum time allowed for a dive based upon the maximum depth achieved. The limits take into consideration nitrogen saturation of lipid tissues. Once nitrogen has saturated tissues, a standard ascent to the surface with decreasing ambient pressure can allow nitrogen to bubble out of solution according to Henry's law. Once the no-decompression limit has been passed, one or more decompression stops are required during ascent to allow delayed diffusion of nitrogen out of the lipid tissues back into the blood. Nitrogen is then exhaled through the lungs. The tables are based on young, healthy and fit, Navy volunteers. Since many civilian divers do not fit this profile, the tables have limitations. The rapidly expanding use of dive computers takes into account the actual time spent at each depth. This allows for more time under water and removes a built-in factor that helps keep divers in the conservative range. There is an increasing number of casual divers. The best defence against DCI is diving conservatively. However, divers may still develop DCI. Today, diving experts recommend a safety stop at 3 or 5 metres for 3-5 minutes. For no-decompression dives, this is essentially a decompression stop. Since the largest change in pressure per metre occurs in the last 5 metres just under the surface, this stop allows for additional nitrogen equilibration and off-loading.